A hoax that is gaining ground on Facebook has some worried about a new possible hack of the social network. Facebook says to disregard the message. The hoax works by targeting a user's inbox on Messenger, with the message making it appear like the user could have a cloned profile. Here's how it works: You receive a message from an existing Facebook friend telling you they've received a friend request from you. Then it says to check your account and to forward the message to all your friends. If you do pass the message along to your friends, the hoax spreads like an old school chain email or letter. It's not the first time a cloning hoax has surfaced. A similar scam happened in the summer of 2016. 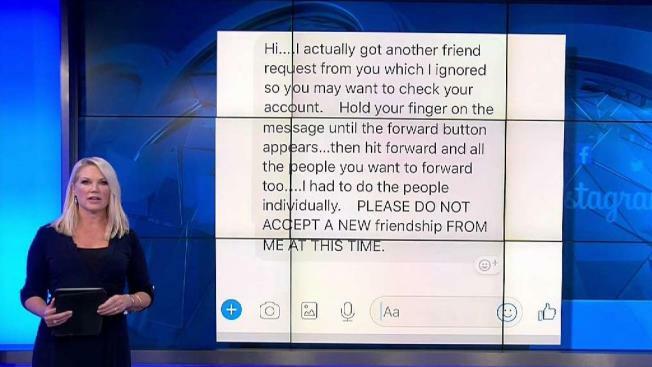 Facebook told NBC 7 that if you get a message such as this from an existing Facebook friend, just ignore it and don't forward it to anyone. If you're concerned, you can check to make sure there isn't a duplicate account in your name. Facebook officials said that despite all the hoax messages, there hasn't been an unusual increase in cloned accounts recently. If someone is impersonating your account, though, you can report them to Facebook here: https://www.facebook.com/help/fakeaccount. The newest hoax is circulating around social media giant Facebook, where users receive fake messages about cloned accounts.